Maha Navami is observed on the ninth day of the Shukla Paksha (waxing phase of moon) of Ashwin month. Maha Navami 2019 date is October 7. It is the ninth and the final day of nine-day Navratri Festival. 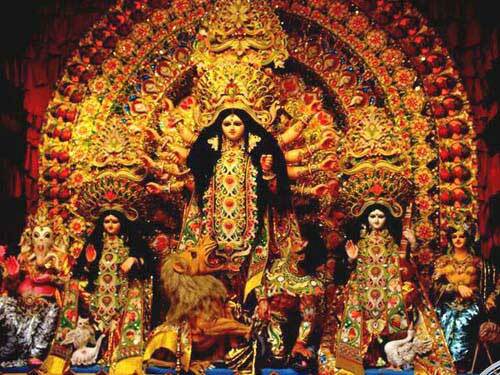 Mahanavami is also the penultimate day of Durga Puja. Navami 2019 date during Chaitra/Vasant Navratri (March - April) is April 14. It is believed that Goddess Durga killed Demon Mahishasura on the day. The rituals associated with Navratri Maha Navami vary from region to region. In South India, Maha Navami is observed as Ayudha Puja. All books, utensils and tools are kept for puja. People do not touch them. They are taken after puja on the Vijayadashami day. The Sandhi Puja which is observed on the conjunction of Ashtami and Navami overlaps into the Mahanavami puja day. This ritual is very popular in North and Eastern parts of India. In some regions, Kumari Puja is performed on the day. A unique ritual on the day is the Vijaya ceremony. People embrace each other and forgive and forget past offenses and promise a new beginning. Kadamati is another unique ritual that is performed by some communities. The members of the family lie down before Goddess Durga idol and sing the praise of the Goddess. Maha Navami rituals are the final rituals associated with Durga Puja. The next day is Durga Murti Visarjan or immersion. Agni and numerous gods and goddesses, minor deities, guardian deities that are invoked during the Durga Puja are given farewell on Navami. The priests are given Dakshina during the course of Navami day. In Bengal, Goddess Durga is worshipped in the form of Aparajita on the day. It is followed by Maha Arati which marks the end of the important rituals and prayers during Durga Puja. There is a major Bhog on the day known as Navami Bhog – favorite food items of Goddess Durga are offered to her. This is then distributed as Prasad. In some regions, animal sacrifice is held on the day. But this ritual is discouraged by many people today and is also banned by the government. But it is still held in rural regions and famous Durga Mata and Kali Mata Temple. In some rural areas, a large number of goats are sacrificed – a continuation of Ashtami day. But today people have realized the futility of animal sacrifice and there is a reduction in the number of sacrifices performed considering the earlier period. The sacrifice ritual is also performed in Nepal as part of the Navami day during Dashain.